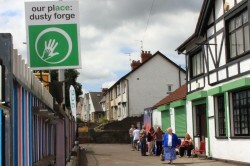 Kill the commute from the west of Cardiff into the city centre by working at the ‘community living room’ that is the Dusty Forge, a vibrant community hub run by local people for local people, on Cowbridge Road West. In collaboration with the local development trust, Action in Caerau and Ely (ACE), Indycube offers a coworking and hotdesking space comprising four to six desks and three meeting rooms seating between 6 and 12 people. There is limited on-site parking available at the Dusty Forge, which is also served by a number of bus services that serve the city centre. Like with all Indycube spaces free wifi, tea and coffee is available at IC ElyCaerau which is accompanied at the Dusty Forge by a Men’s Shed, community shop, volunteers, training room, garden and workshop. Indycube Ely Caerau is open from 9am – 5:00pm Monday to Friday.